Secure and reliable energy supplies are an essential part of modern economic life. But the national and global infrastructures that deliver energy are changing rapidly in the face of new and unprecedented challenges, including the need to meet ever-increasing global demand for energy services, whilst reducing CO2 emissions caused by burning fossil fuels. Responding to these challenges will likely involve the development of new technologies, as well as increased deployment of weather-dependent renewables, such as wind and solar power, in the energy mix. This new energy landscape exposes stakeholders in the energy sector to a greater risk from weather and climate than ever before. Better understanding the impacts of climate variability on energy supply and demand therefore has the potential to aid policy and decision makers in evaluating risks. The European Climatic Energy Mixes (ECEM) project is a Copernicus Climate Change Service (C3S), whose aim is to enable the energy industry and policy makers to assess the impact of climate variability and change on energy supply and demand over Europe. A proof-of-concept service – or Demonstrator is being developed, including datasets that bring together climate and energy data, produced in a consistent way covering a range of time scales and countries in Europe. The ability of the tool to provide insight into events, anticipate future risks and ask ‘what if’ questions is illustrated in the context of the unusually cold winter of 2009/10. Many countries across Europe experienced unusually high levels of gas and electricity demand due to cold weather conditions during winter 2009/10 (December 2009 to February 2010). 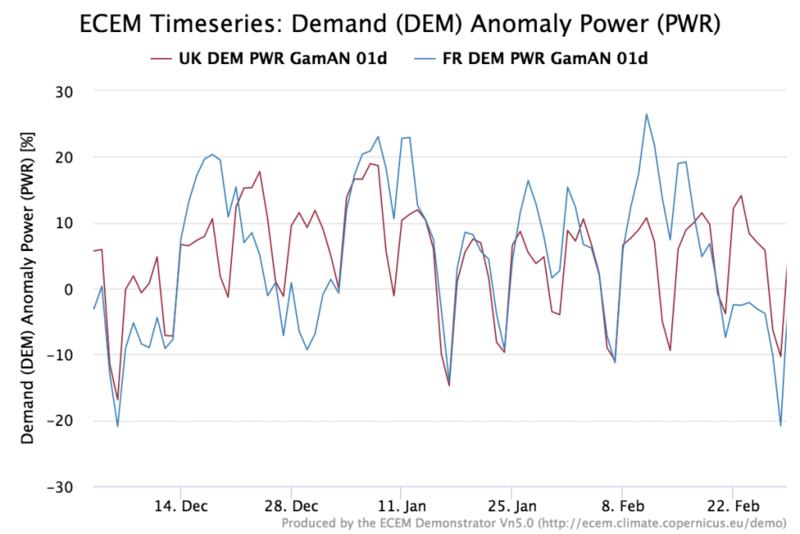 In the UK and France high levels of day-to-day weather-sensitive electricity demand is seen in the ECEM dataset (Figure 1), with demand exceeding 10-20% above normal levels for several days over the winter. Figure 1: Daily fluctuations in modelled weather-sensitive electricity demand. Normalised anomalies expressed as difference in percentage from the long-term average (1979-2016). Winter 2009/10 made headlines for being unusually cold across much of northern Europe and saw some of the lowest temperatures in the last 40 years in the UK. There was a strong contrast between conditions in northern and southern Europe (as seen in Figure 2 for winter mean temperature differences in 2009/10), consistent with a southward-displaced jet stream and a prolonged negative phase of the North Atlantic Oscillation [Reference 1]. 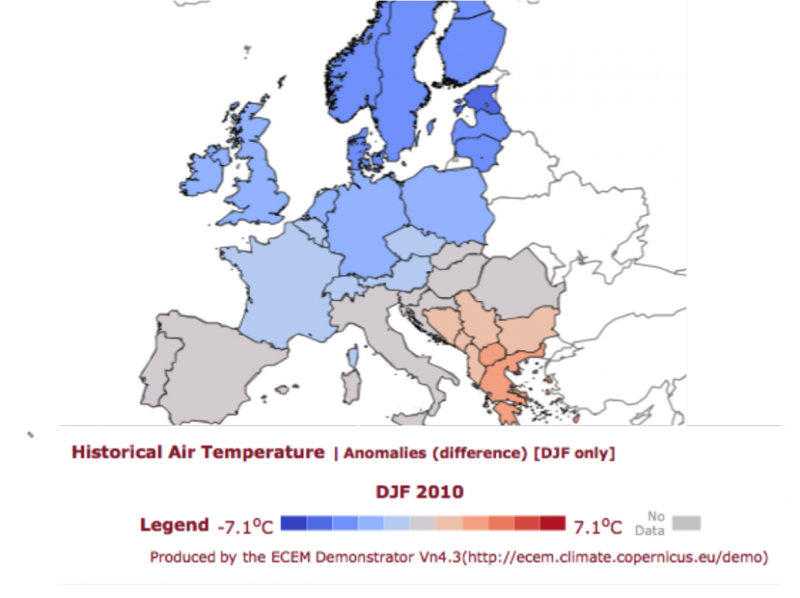 Figure 2: Temperature anomaly (degC – differences from 1981-2010 mean) across Europe for winter 2009/10. What if winter 2010 happened today? The ECEM historical dataset also provides estimates of renewables energy supplies based on today’s energy mix and the historical climate drivers. This allows us to investigate the potential impacts of past climatic events if they happened today. A winter like 2009/10, which saw persistent cold and still conditions in the UK, would have a larger impact on the energy sector today due to the increase of renewables into the energy mix. For example, in 2010 renewables consumption was around 3% in the UK, rising to around 8% in 2015 (with wind power accounting for 4%) [Ref 2]. The low wind conditions in a repeat of winter 2009/10 would lead to a substantial reduction in wind power production over the season (Figure 3), which could lead to increased risks to electricity supply availability when combined with an increased demand due to low temperatures. 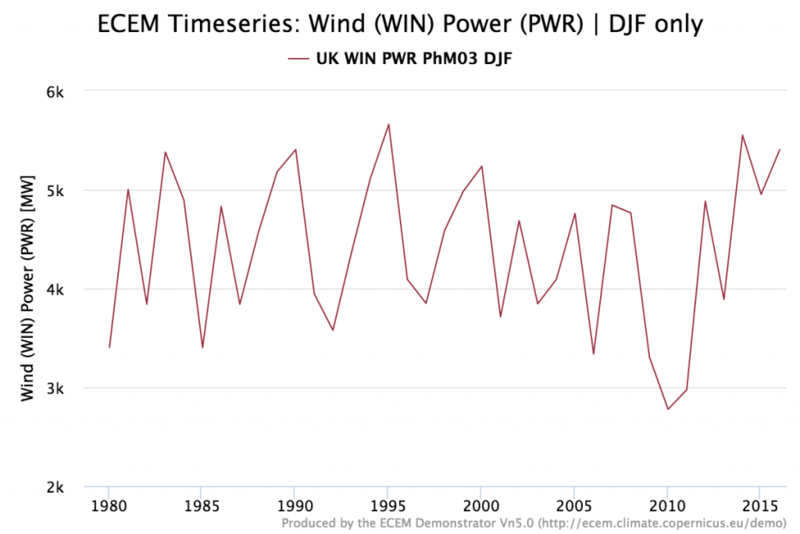 Figure 3: Estimated winter mean wind power production based on the historical wind speeds and today’s wind power generation capacity for the UK. Whilst winter 2009/10 was unusually cold compared to recent winters (i.e. the last 40 years), it was warmer than winter 1962/63, despite exhibiting very similar atmospheric conditions (a prolonged negative phase of the North Atlantic Oscillation, NAO-). It has been suggested that winter 2009/10 might have been even colder if the overall global warming trend observed in the 20th Century had not occurred [Ref 3]. Climate projections of winter temperatures over Europe generally show a warming trend out to the end of the century, suggesting that cold winters, such as 2009/10, may become less likely in future (Figure 4). This has implications for winter demand, which has a negative relationship with temperature over most of northern Europe. Projections of wind speed typically show no clear indications of any trend, however, with the increase of installed wind power generation over Europe it is likely that any future power system will be more sensitive to weather-dependent renewables generation than to temperature-driven demand. Gaining a better understanding of the impacts of climate variability and change on the energy sector is therefore an essential area of research [Refs 4-7]. 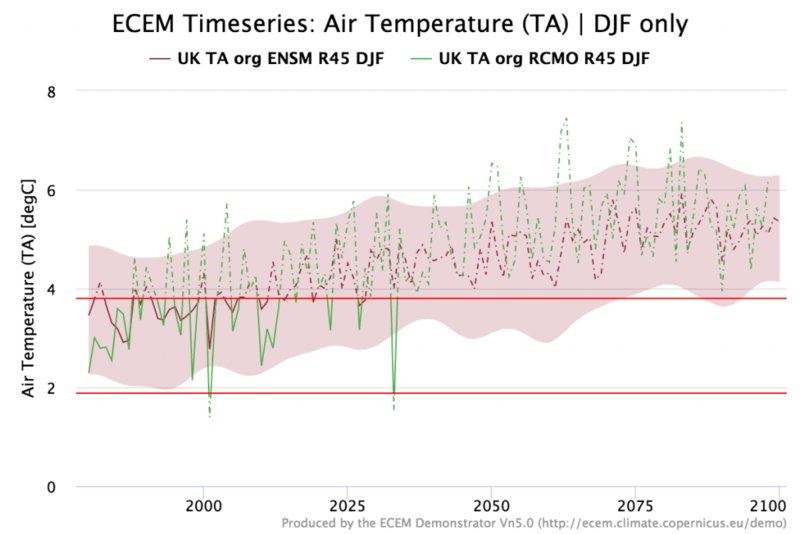 Figure 4: Projections of winter mean temperature from the RCP4.5 climate scenario over the UK. The shaded region shows the smoothed upper and lower bounds from an ensemble of models, the red lines indicate the 1981-2010 winter mean temperature (top) and the 2009/10 winter temperature (bottom). The green line illustrates the variability from one model run from the full ensemble. G. Ouzeau, et al., 2011. European cold winter 2009-2010: How unusual in the instrumental record and how reproducible in the ARPEGE-Climate model? Geophysical Research Letters, 38, 11. This entry was posted in Climate, Climate change, Climate modelling, Renewable energy, Seasonal forecasting. Bookmark the permalink.